Who Wore What: Our Fave Looks From Poorna Patel's Wedding Reception! If you thought you are done with your dose of celeb weddings for the month, enter Poorna Patel. Poorna Patel took over our Instagram feeds with her elaborate wedding pics. 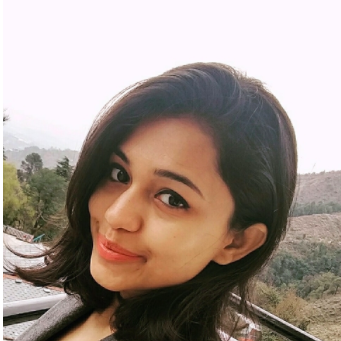 The daughter of the former civil aviation minister Praful Patel got hitched to the managing director of Namco Industries, Namit Soni on Saturday. And like the case is with every high profile wedding, Bollywood was in full attendance. Just like the sangeet and wedding, the reception also saw the who's who of tinsel town. From Katrina Kaif, Neha Dhupia and Sagarika Ghatge, celebs brought forward their most stylish desi looks. Take a look at our faves! Katrina kept her look simple and elegant in a white Mishru lehenga with gold embroidery. She accessorized her outfit with a stone necklace, matching tops and a tiny black bindi. Such a perfect summer wedding look! The newlywed Neha Dhupia is always on point with her fashion choices. For Poorna's wedding reception, Neha chose a royal blue benarasi Raw Mango ensemble and looked every bit elegant. Giving her company was hubby Angad Bedi in a Shantanu & Nikhil creation. Sagarika has been killing it of late with her desi looks. Remember, how she stunned at Akash Ambani's reception in a royal blue saree? And now, we are drooling over her last night's reception look too. Dressed in a gorgeous silver embroidered saree by JADE, she looked breathtaking. We're totes bookmarking this for the next wedding we attend! Sophie has donned some of the most amazing Manish Malhotra designs ever. One such was at Poorna Patel's wedding reception. She sizzled in a light grey metallic Manish Malhotra saree and paired it with a shimmery off-shoulder blouse. Quite a look, we say! Sonakshi Sinha chose lemon yellow for the starry night. The Dabangg star was at her desi best and slayed in a signature Abu Jani Sandeep Khosla chikankari anarkali. A statement ring and earrings completed her look. 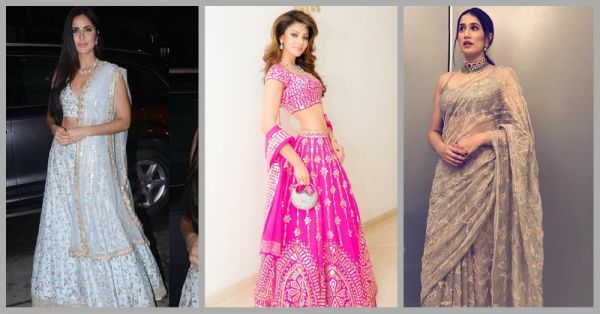 Urvashi Rautela also opted for an Abu Jani Sandeep Khosla lehenga and OMG, she looked like such a stunner! We are in love with the hot pink colour and the mirror work just adds to the glam. Drool-drool!! !